After a pretty long nap 3DS Virtual Console wakes up today, and DSiWare swells with a hidden object adventure too. This is much more like it. Kirby's Block Ball (Game Boy, Nintendo, $2.99, 40 blocks) — At long last, 3DS gets another Virtual Console game in the rotund form of Kirby. 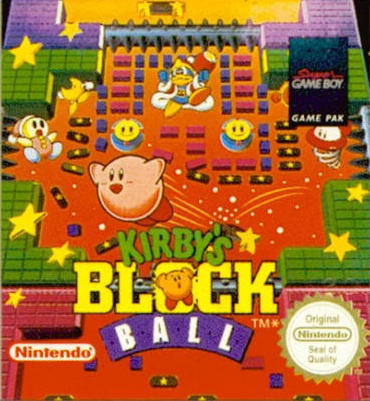 Check out our Kirby's Block Ball review to help you along with your purchasing decision. Rayman Origins (Ubisoft) — North Americans get to try out Rayman's 3D-2D adventure as well with a free slice of his upcoming game. Chronicles of Vampires: Awakening (Teyon, 500pts, 96 blocks) — More hidden objects in the world of nocturnal neck-biters. Prequel Chronicles of Vampires: Origins wasn't great, but we'll see how this new title stacks up in our upcoming review. Men in Black 3 in 3D (available May 18 at 6 a.m. PT) — Watch Will Smith, Tommy Lee Jones and Josh Brolin in 3D, for free. That's better than a kick in the teeth. There we go, folks. Good week for you? Very glad to see another demo. Good to see the Rayman demo. I really wasn't expecting it since NOA has been very stingy with them. I will be purchasing Kirby's Block Ball and will defiantly download the (been waiting for this demo) Rayman Origins demo. Great week! Getting the demo and Kirby's block ball! It's good to have a 3DS VC game back on the eShop after the crazy 2 months of stupid nonsense we had to deal with. Here's hoping that the North American eShop doesn't go back into idiot mode next week after we get Kirby's Block Ball this week. I've been wanting to try this game ever since I found out about it being in our eShop since the beginning of May. As far as I'm concerned, Kirby has saved the 3DS VC line of retro games, for now at least. I may get Kirby's Block Ball, but I'm definitely trying out the Rayman Origins demo. It'll be neat to see that already gorgeous game in 3D. @3DS_Supporter Looks like 5th June to me. You only get a VC game this week because there's no 3DSWare game. If that really is the reason we've not had a VC game in so long, they can keep their cheap, shallow phone app rip-offs and give me some real games on a more frequent basis, kthx. ^^ Then we would only get like 3 a year because of the development time required. No thanks! Wow! VC and a great looking demo!!! ....I really hate to say 'oh no Myths and Mosters or Wario again', but this will work. I'll settle for this Kirby themed puzzle game and a Rayman demo! And a nice little Men in Black 3 video. @XXITheWorld Kind of have to agree with him...does seem like every seems to think NA likes iphone apps more than classic games. My 3DS is doing a system update. Is this for Mario Kart or something else? I just updated a couple of weeks ago when they changed the store and added folders. Well not Mario Kart, updating that now. but the system did update, just don't know what it did. And of course no Rayman until noon, I forgot about that, doh. I'll have to download the Rayman Origins Demo, hoping that it isn't as much of a piece of crap as Rayman 3D was. I just played the first stage of Rayman Origins and wasn't too impressed. The graphics do look quite lovely in 3D though. @XXITheWorld You should clean your house better so your stuff doesn't get so dusty. Men in Black 3 3D Trailer? LOL I've had that on my 3DS for Months now. Played the Rayman Demo. Now I have to make a difficult choice - HD or 3D? No clue if I should stick the Wii version or not. Even more now. I guess I'll have to get that demo, and Kirby looks interesting. I may just get it. 2.99 for Kirbys Block Ball. I just might have to pick that one up. we nned a kirby 3ds game!! I had Kirby's Block Ball when I was little, and it was awesome. I just replayed it a couple of years ago. Definitely a good buy. And Japan is getting Kirby Super Stacker next week, so you guys have that to look forward to as well. I already have Rayman Origins on 360,but it won't hurt to see how the game looks on the 3DS. I may get the Kirby game one day. Kirby's Block Ball is a great little game. Don't dismiss it as "just another breakout clone", because there's a lot more to it hidden under the surface than what meets the eye. Played Block Ball years ago, I'd rather have Dreamland 2. Lucky Europeans. Nothing for Wii but i´m happy with last 2 weeks, i donwloaded the last Sega games and they´re excellent. Oh cool, the eShop says that Game & Watch Gallery 2 is coming next week. @Luigifan141 I kinda wish we got the GBColor version of G&W Gallery 2, but we never had that version from the start, just the regular GB version. We are getting the GBC version. The screenshots show it in color. @Koto: I'd rather have both...lucky Europeans. @Luigifan141: It was only released in color in America, and black and white in Japan. So both regions are just getting our native versions. Good game, anyway...hope they follow through on that release promise. And of course...Block Ball is mine. No way I'm going to complain about its absence and not buy it straight away, especially for only $2.99. Kirbys Block Ball AND the Rayman Origins demo? Best. Week. Ever!! !.......in a while. Played two levels of the Rayman origins demo, and I got what I expected... a half baked and somewhat choppy port compared to the console version. That's not to say it was bad or anything, but it is a rough job. For the most part, the game still manages to look stunning albiet blurry, and manages to run at a stable frame rate Even if it runs at half of what the console version is running at. What disappoints me for the most part is the Sound, most of which are compressed. Other than that, it was an adequate effort to fit Origins to the small screen, though I do hope Ubisoft fixes some issues before launch. The Rayman Origins demo is nowere to be found in my eshop... i already got the message that is available but is not in the demo section... wtf? Next week we'll be getting G&W2 it looks like! Anyone else notice that on the shop? Where's 'Retro City Rampage'???? (/nothing for me this week). @Luigifan141 Huh? I know you are, I'm talking about my region. I live in Japan...EU got the color version as well. Played some Kirby Block Ball. Definitely the most fully-featured Breakout clone I've ever played (I hesitate to even refer to it as such) and well worth the $2.99. Also picked up the Rayman demo but haven't tried it out yet. My 5 year old nephew got it this morning and he seems to enjoy it though. See, these are the weeks I like on the eShop, Nintendo. Keep this trend going. I guess it's back to Wii getting nothing again. I'm not too upset because Monster World IV finally came out along with an online-enabled Super Street Fighter II. I've lost much of my interest in Noitu Love 2 for Wii since I bought the PC version. I doubt Last Flight will ever make it to WiiWare, which is a shame because there are still no games on Wii's download service which are violent enough to be rated M.
@Tsuchinoko I didn't know what you meant at first since your profile says that your region is the United States. Sorry for the misunderstanding! Got Kirby, my first download in a while. I'll probably get the Rayman demo, too, even though I already have it for 360. Awesome week is awesome! Now I can play Kirby's Block Ball for the first time! And we get a Rayman Origins demo, sweet (even though I still need to play the Vita and Wii versions that I own)! @Luigifan141 Crap, I thought I changed it back to Japan. I was in the States and Canada for a bit. Sorry. Kirby super Stacker, Kirby Pinball Land, and Block Ball. I didn't know there were so many Kirby puzzle games. With Game & Watch Gallery 2 hopefully being the next release, I am hoping that the first G&W will be the next free coin download. wow...I feel bad now. I know that NA especially wants a lot of VC games. I live in Japan and the only 3DS VC games I have are Zelda: Links Awakening DX and Legend of Zelda 1 for the NES. I did also buy that so-so Sudoku game as well, in addition to one DSiWare game that didn't come out for the non-Japanese VCs. I haven't really gotten anything, but I'm mostly waiting for Game Boy Wars 1-3 and the Pokemon Games, as well as the Oracle Zeldas. Any recommendations? I never owned a portable system, not until the GBA anyay. Thinking about a Warioland game...which one is best? BTW, I mostly just play Monster Hunter 3G, so thats what my 3DS time goes to for the most part. Getting Fire Emblem this weekend too. I would love to try a new Game Boy era game. Had KBB as a kid, so that's a must download for me. Never played anything Rayman related before, but that's going to change with this demo. Just checked the e-shop and they also have a preview of next weeks releases, with videos, Game and Watch Gallery 2 and Snakenoid Deluxe which looks like a Araknoid/Break out except that you control the snake with your finger on the touch screen rather then the d-pad. I agree with Berzerker when will Retro City Rampage be released? I usually don't purchase violent games, but I plan on purchasing RCR if and when it is released to support the game, since it's very polished and is not cheap shovelware. @James it appears that Retro City Rampage now has a release date listed as TBD. I'm going to try the Rayman Origins demo and may get Kirby's Block Ball in the future sometime. @MrBabySpencers That is one Demo we dont need but maybe it might turn out good, Probelly not. Can somebody, anybody tell me why we still haven't received Prince of Persia on the SNES VC yet? Should I just give up, and forget about it ever being released here? I'd really like to know. The nearest title to PoP we've received is Pit Fall, and I have no plan of ever downloading that. Also, only one more week until Retro City Rampage is once again considered vaporware. My Rayman Demo (kinda) glitched. In the 3rd level, I got the big electoon that makes the other ones turn red and dance. However I took damage, and the electoon kept dancing and remaining red, but the music stopped. Odd. And I much prefer the Wii version. Looks way better on a big screen, and the controls are tighter. Also the sound is clearer. Excellent week! I've been waiting for Block Ball and the Origins demo for some time now. Thanks much Ninty! @Tsuchinoko "BTW, I mostly just play Monster Hunter 3G"
I wish Nintendo added Super Game Boy support to the VC GB emulator. Kirby's Block Ball (among others like Kirby's Dream Land 2 or Donkey Kong 94) looked a lot better. Wow I can't believe us N. Americans are getting a Game Boy Color game next week. Looks like NOA woke up. @G4L Probably because the SNES original is on the disc for the Wii game "The Forgotten Sands". May get Kirby's Block Ball, as I love Arkanoid-style games, and just to support 3DS VC! I'd encourage everybody to do the same. After all, the more VC games are sold, presumably the more often NoA will release them! This is a start, but still waiting for Super Mario Land 3 and Kid Icarus: Of Myths & Monsters that have been out elsewhere for MONTHS. I don't think SML 3 will be here until around August when the release of NSMB 2 is close, though. And I have no idea what to think of Kid Icarus. Hoping since they're things many are looking forward to that something will be said at E3 (plus hoping for TLoZ: A Link to the Past remake news). @FluttershyGuy I doubt it will take that long for wario land and kid icarus. They probably will be here around E3, that's my guess. Glad we are finally catching up! Why didn't you tell us the block number like last week? Nice to finally get Kirby's Block Ball this week. Hopefully more VC titles will be on the way to the eShop soon. I wish that I could say that I enjoyed the Rayman Origins demo but sadly I did not. It is a poor port of the original. I own it on the PS3 so I will just stick with that version and wait for Rayman Legends on the Wii U.
Oh my God! Finally! I finished my high school education by slaving away at my internship and playing Kirby's Block Ball with every free moment that I had, and it's awesome that it's finally available. It's enough to make me forget my Steam library to be able to lie on the couch and play this game. Downloading it and the Rayman Origins demo now. OH YES! What a great week! We finally have the game that we've all been waiting for. @StrawHatChopper, I'd rather not be forced to play through a medicore 3-D Prince of Persia title, just to unlock the ability to play the retro SNES entry. Plus, having the game available on VC is bit more convenient and accessible as well. Also, it's not actually the SNES version that's unlockable in Forgotten Sands. Which is definitely the version I desire to play. KBB, if I ever get enough cash to spend frivolously, & purchase an eShop card lol. This time around, I'm only d/ling VC titles I never originally owned/played, w/ few exceptions. Edit: Yes, I really wish Nintendo added full-Super Game Boy emulation code to their emulator(s)(possibly plural, depending on if the 3DS has an emulator built-in, or each VC plays on it's own emulator code). It would be so awesome. I still am a little hesitant to purchase any GB VC that has currently-unsupported SGB enhancements. I don't wanna pay for VC titles, that have more to offer, than I can access/experience (in-game), solely based on the limits of the handheld's programming. W/ a few necessary tweaks, literally everything I just mentioned/listed could be done on, & w/ the 3DSVC. I thought NA VC was going to get Kirby's DL2 like Europe ...does anybobody know when Dream Land 2 will be realeased for North America? It´s just fair that NA gets less VC than Europe. Oh yeah! Of course, I'm going to go purchase an SNES console just so I can play Prince of Persia. Hey! If you want to purchase me an SNES and the PoP cart @Fabian, be my guest. Otherwise, I'm going to keep on complaining. There's no excuse for why NOA hasn't already released PoP here. Pit Fall can go fall in a pit, because I could give two shakes about that game. @Fabian But those titles for 3DSWare (Besides Sakura samurai) are third party, and they are probably going to come out any moment over there. If we start to lose the 3DS VC again in June, (I doubt it due to E3), then we will really be behind. Plus some games are better on the 3DS anyways. I do hope we all catch up at the same time, though! ...does anybobody know when Dream Land 2 will be realeased for North America? Nope. All that is known that Game & Watch Gallery 2 is next in America. Nobody knows what is next after that.